Golf season is in full swing, and The Real Deal wants you to join us for a day of cocktails and caddies on Monday, July 24. 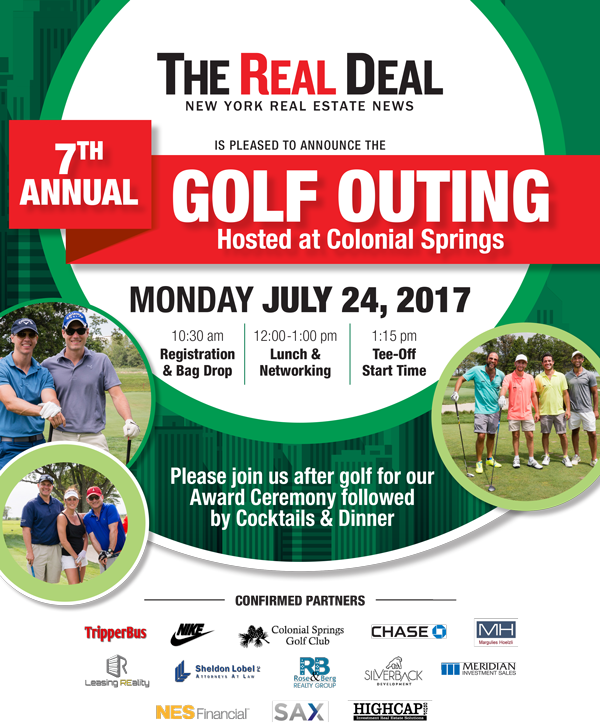 Beginning at 10:30 a.m., real estate pros (and budding PGA stars) will gather at the Colonial Springs Golf Club in East Farmingdale for TRD’s seventh annual golf outing. Beyond boasting your hole-in-one skills, enjoy a day of premium aperitifs, lunch and dinner on us, and an awards ceremony to honor the day’s top linksmen. To buy tickets to the outing, and learn more about sponsorship opportunities, send an email to Golf@TheRealDeal.com. Limited sponsorship opportunities are still available, including the prized Nike Giveaway Sponsor, the golf ball sponsor and more.